People were left in shock after a car ran under a trailer laden with 40ft container on Friday close to Ojuelegba, Lagos. 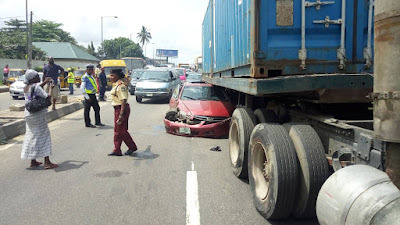 According to the Twitter handle of the Lagos State Traffic Management Agency, @followlastma, the red car ran under the trailer, just before the Dorman Long Bridge connecting Ojuelegba to Fadeyi Bus Stop. 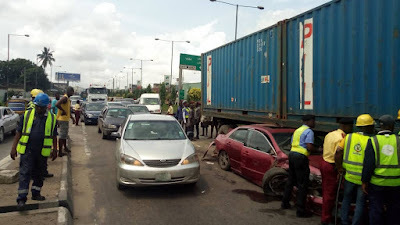 The accident caused traffic build-up that extended past Stadium Bus Stop on Funsho Williams Avenue. The situation was eventually brought under control by the traffic agency.